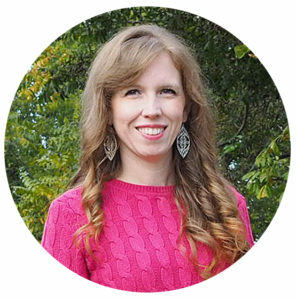 Anyone else get sentimental about toys that your kids outgrow? 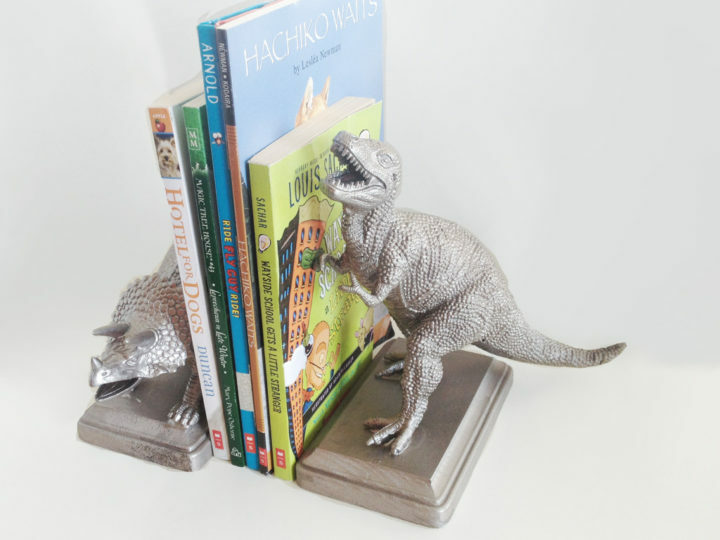 Rather than getting rid of a favorite toy use it to make these DIY Kids Toy Bookends. Kids outgrow toys. It’s just part of life. But as a Mom there are certain toys that I find more sentimental than other toys. And a few that I just want to hang on to a little while longer. I have created a DIY for doing just that. 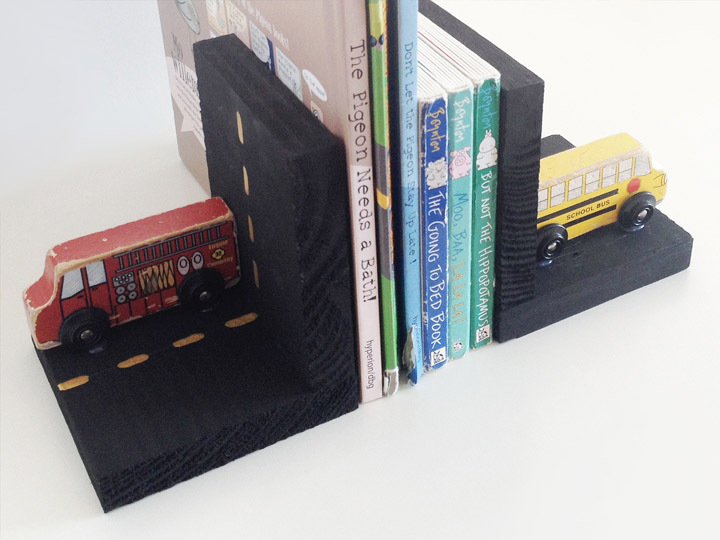 Turn some of your kids unused toys into DIY Toy Bookends for their bookshelf. Start by attaching your toys to the wooden base using the epoxy glue. Follow the directions on the package for gluing your item and allowing it to dry completely. Once your toys are securely attached you can start spray painting them. 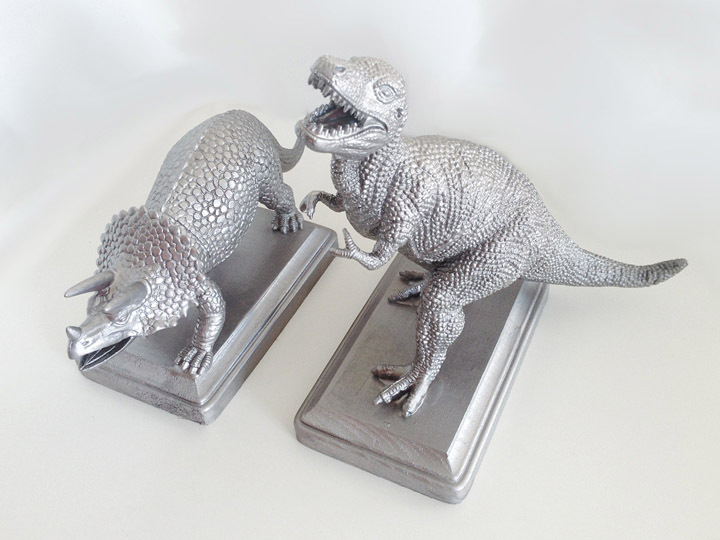 I chose a metallic finish spray paint for my dinosaur bookends. Apply several light coats of spray paint, allowing the paint to dry between coats, until your toys are completely covered. Once the final coat of spray paint is dry your bookends are ready to be used. The teenagers in particular thought that these ‘metal’ dinosaurs were really cool, even though it’s my younger son who has been playing with the dinosaurs most recently. A small warning: Do be careful to make sure your child is really, completely finished with a toy before you turn it into a bookend. 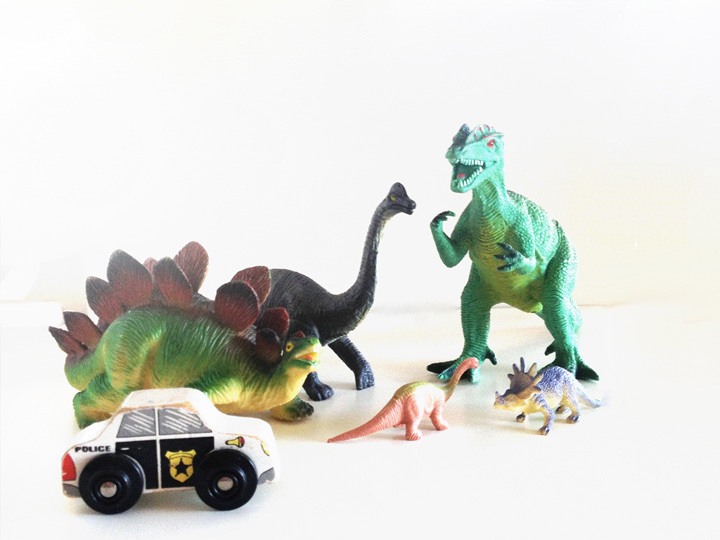 My youngest son wasn’t thrilled at first with the dinosaur bookends. Once I started making toy bookends, I just couldn’t stop! So here is a second bookend option. Nail two wooden blocks together to make each bookend. Then paint them black and allow them to dry. Use your yellow paint to add the road lines on your blocks. My stripes are each ½” long. 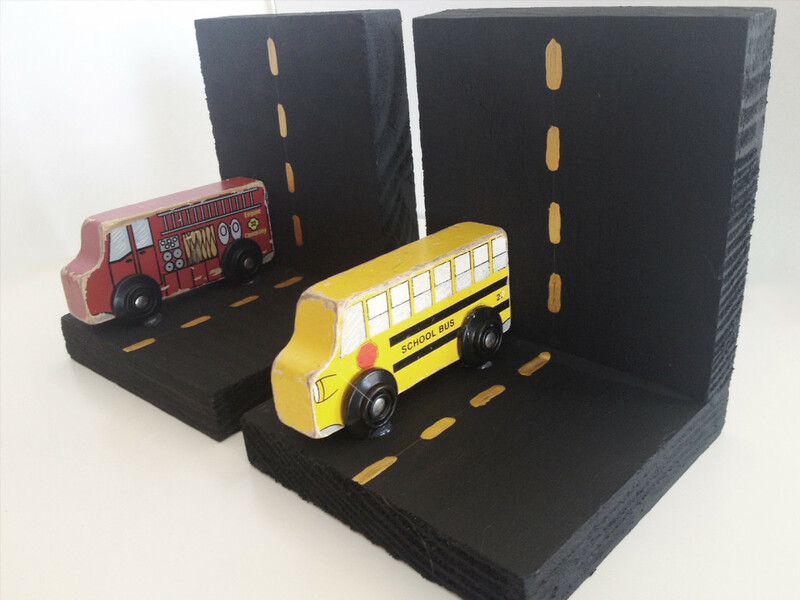 Use the epoxy to attach your toy cars to the road on your bookends. My youngest son in particular really liked these bookends. I think mainly because I didn’t do anything to alter the toys themselves. He liked the addition of the road for the cars to drive on. A simple way to add some fun to your bookcase!